Sun-Mi Hwang’s The Hen Who Dreamed She Could Fly (translated by Chi-Young Kim) is the story of Sprout, a hen trapped in a coop inside a farm shed. Enjoying the views of the outside world she can see from her position near the door, she dreams of freedom, and the opportunity arises when she is taken out for culling. This brush with death is almost the end, but the plucky bird manages to come through and is rewarded with her freedom. The Hen Who… is an enchanting read, a fairytale-style story with a brave heroine you can’t help but admire. The book sold millions of copies in its native land, and it’s easy to see why. It’s a novel that will appeal to children with its entertaining, easy-to-follow plot, but it also has a lot for adults in the messages included beneath the narrative surface. The main drive of the story comes from Sprout’s discovery of an egg left unattended in a nest. Unable to lay any herself, she decides to hatch it, while her friend Straggler, a duck shunned by the rest of his kind, guards her. It doesn’t take a genius to work out that there’s no hen in there, but that’s not important for Sprout. Having successfully watched over the fragile egg until the creature inside emerges, she can finally call herself a mother and is determined to take care of her child. Sprout was thinner than ever. She ate only to stave off hunger and spent all her time running around looking for Greentop, so she’d gotten as small as a reed warbler. In this portrait of a self-sacrificing mother, we find echoes of another successful Korean book, Shin Kyung-sook’s Please Look after Mother, but where Shin’s work was a little manipulative, this one is far more successful. Sprout is fully aware that time will gradually pull her little family apart, so even while her energy slowly ebbs away, she does all she can to give her ‘son’ the best possible chance of survival. However, these readings simply add depth to what is already an excellent story. 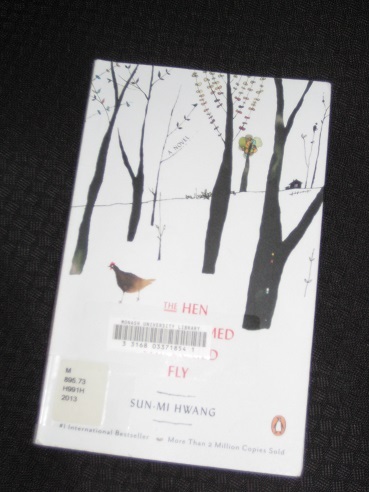 Another influence on The Hen Who… must be Hans Christian Andersen, and Chi-Young Kim crafts an excellent English text here, simple yet elegant, that adds to this fairytale style. The reader follows the indomitable Sprout as she does the impossible, rising from the dead, taking on farmyard society and protecting her charge from the dangers of the wild. Then, just as you think you’ve got a handle on Hwang’s story, she inserts one final twist. Just as in real life, if we look a little deeper, we can find the motivation behind the worst of actions, and the final pages cause the reader to reflect on the wider significance of Sprout’s struggles. Stu – I actually had that one too but never read it. I might give it a try at some point. I suspect that the negative comments about the book (the ones you refer to at the beginning) must be because the naysayers read it superficially, as a fairy tale. Your review instead plums the depths of the work, and at the same time considers it from a very wide perspective. It sounds like something I want to read.